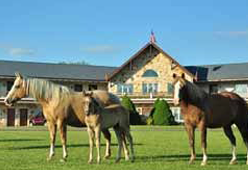 Kick back and relax with the wine tasting and horseback riding options at Guggisberg Swiss Inn in Millersburg, Ohio. Our Inn overlooks Ohio Amish Country's Holmes County Doughty Valley, so you are guaranteed that every room has a breathtaking view of the farmland. Make a memory that lasts a lifetime and take a guided horseback trail ride through some of the most beautiful countryside that Ohio's Amish Country has to offer. See Holmes County in a whole new way while relaxing on one of our beautiful horses. Specializing in small tours for that personalized touch, we take only two to five riders out at one time. Amish Country Riding Stable features Western-style riding quarter horses. We add winter fun with horse-drawn sleigh rides. Guggisberg Swiss Inn opened a winery in September of 2013, which initially offered eight wine choices, from semi-sweet to semi-dry. Enjoy a glass and take a stroll around the property or uncork your own bottle while relaxing on the swing by the duck pond. Our tasting bar is open during Guggisberg Swiss Inn operating hours. Pick up a bottle as a gift for your next holiday party, and don't forget to add wine, cheese, and chocolate baskets. Contact us today in Millersburg, Ohio, and enjoy horseback riding and wine tasting at our inn.